Martin and I have been married for 11 years and some months, most of our adult lives. Like any couple, we have moments of severe dissonance, when we look at one another and see strangers, or even enemies. Sometimes it’s a decision one of us makes, sometimes it’s disciplining the kids, sometimes it’s the way money is spent or time allocated. It can affect our relationship with the outside world, or be a purely internal disagreement. The one of us observing, and reacting to, the word or deed in question may feel excluded, overridden, or disenfranchised. The consequences of a wrong choice may seem overwhelming and disastrous. The agent, meanwhile, will feel betrayed and defensive at having a good faith decision questioned. Resolving these disagreements, finding common ground, and dealing with the risk of error are some of the most difficult tasks in any partnership. It’s hard to listen to the objections of the overridden spouse; it’s even harder to live with what seems to be a wrong choice by your partner. And maintaining the discipline to avoid recriminations or smugness (depending on how the controversial decision comes out) is yet another perennial task. Martin and I rarely achieve perfection in all these areas; we usually reach adequacy. A small proportion of married people rarely face the challenge, either because they don’t disagree or because they rigidly delegate responsibility. But for the vast majority of married couples, this is the source of such trouble, such strife and such grief, that they lose, for a time, the joy of their union and shared purpose Some can’t overcome the alienation and start to see their partner as an opponent. That, of course, is the road to divorce court. We who stay married endure these trials because we are richer with one another than alone, even when we are at odds. We work at marriage because we made a commitment, and because we share so much that cannot ever truly be separated. And when the quarrel ends, we savour the sweets of our union all the more because they are earned, not given, and because they are the greater for it. Right. Now read Republicans and Democrats in there instead of a married couple. The problems that plague my country in the aftermath of the election are the same as any couple in trouble: miscommunication, mistrust, and the sneaking suspicion that the other party isn’t striving for the greater good. But even more than a marriage, a nation is all but indissoluble. We are one land and must learn to live together. The same principles of compromise, communication and determination that make a marriage work are needed to make the nation work. Now go to it, guys. Being an American abroad can be difficult sometimes. There’s so much to defend, to explain, to demystify. Now is certainly one of those times; I spent a lot of yesterday failing in my earnest desire to discuss anything but the election. The stories that don’t make Fox, or Clear Channel, or the Murdoch press: the death of innocents in Iraq and Afghanistan, the erosion of the case for war, the French as a rational nation with a reasoned viewpoint. Bush the bumbler, Cheney the crook, Rumsfeld the hatchet man. Alert statuses changing from puce to chartreuse to teal whenever there’s an awkward story to bury. Historical analyses of how Saddam Hussein came to power and was kept there; the deaths of Palestinians as well as Israelis; a positive view of Democrats. I don’t see this news either, but I can make some guesses: Bush the charming, folksy man verses Kerry the cold, stiff intellectual. A judge who feels his allegiance to Christ supersedes his obligation to separate church and state. Gays lining up to marry in coastal states, intercut with deliberately shocking images of Gay Pride parades. World War 2 documentaries, the fall of the Soviet Union, the Reagan days. The 700 Club and Christian radio. People who voted for Bush were not by definition idiots, or insane, or evil, as many people on the Net have stated in their anger and disappointment. They voted as sombrely, with as much thought, commitment and dedication, as the rest of the electorate. But their priorities, their aspirations, and their worldview are different from that of my Scottish colleagues, so different that there’s almost no explaining it. The lives they lead – or at least strive for – are classic Norman Rockwell. Small towns of good neighbors, where doors are not locked (or haven’t been within living memory), where children go safely to school and families to church, where people work hard and value honesty and faith above money and power. Marriages last, teenagers don’t get pregnant, no one has affairs or abortions, or suffers from domestic violence. There are no drugs, maybe not even alcohol. Summer vacations are spent at “the lake” (there always seems to be a lake); Christmas and Easter are religious holidays rather than just time off. When jobs are scarce and times are hard, everyone pulls together, and every funeral is followed by a succession of covered dishes. There are a lot of flags, and not just at the Fourth of July parade. Folks have no need to go to foreign places, because America is the best country in the world. People may not live this way in real life, but a large proportion of Americans wish they did. I do, sometimes. And the Midwest, the farm states, are the custodians of this dream. They see themselves as the moral compass of the nation, the heart of the land. The coastal states are corrupted by their contact with foreign cultures, too much money, and too many intellectuals. Kerry never spoke their language, though as a combat veteran he had an “in” that his East Coast lawyer image couldn’t ruin. But Bush and his colleagues talk the talk, however little they walk the walk. And the anti-foreigner, anti-intellectual message has been underlined for years by Republican-owned media that panders to its viewership’s biases. (Just as the New York media does, by the way, and the Californian, and the various flavors of British – a news channel that its viewers doesn’t like doesn’t survive.) A Midwestern voter could get up, switch off Fox News, listen to Clear Channel on the way to the polling station, and vote the way his pastor suggested (using copious Bible references), with a clear conscience. It all made sense; all the inputs hung together. I don’t know how to change the Midwest, or whether it would be a good idea to try. I don’t think anyone has the right to but the Midwesterners themselves. Perhaps the Internet, with its wider spectrum of news available, will broaden views (though it’s equally possible that it will simply consolidate them around a few conservative websites). Perhaps, as with Clinton’s “The Economy, Stupid” message, some unifying problem will cause the heartland to vote for someone who is more palatable to the rest of the nation and the world. I do know, however, that berating Bush supporters, calling them stupid, or ignoring their reasons for voting as they did will not get their votes in the future. Once the hurt has died down, I hope the rest of us can distinguish between the voters and their candidate. (Just as I distinguish between our soldiers, whom I respect, and the people who sent them to war, whom I criticize.) As an American expat, I may oppose any attempt to pare down our Constitutional rights, may cringe at what Bush says and does on the world stage, and may very well worry for the future he builds. But I’ll still be defending Bush voters to my British friends and colleagues. As part of my desire to encourage a little more civility in American politics, I have decided to give a gift to someone whose politics I disagree with. 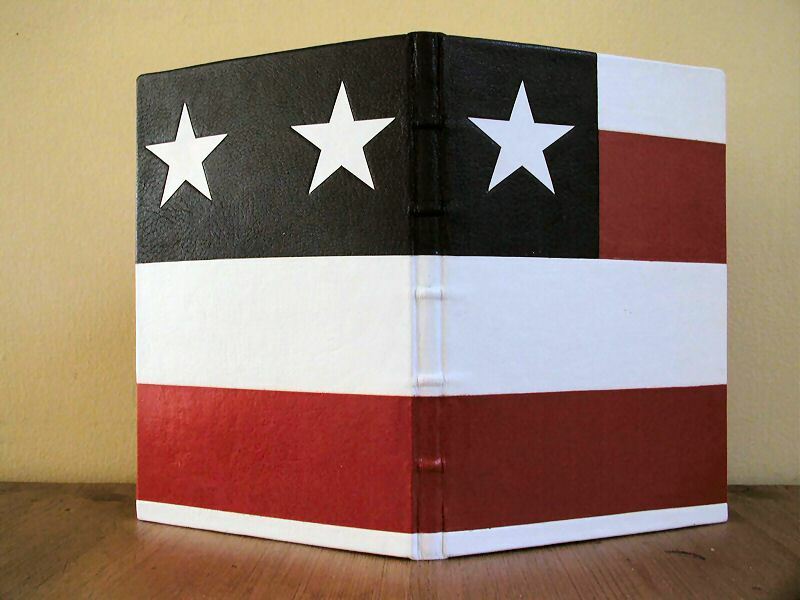 Specifically, I’m sending a handbound copy of the Constitution to President George W. Bush. I was going to be sarcastic about it, and say something about the rules of good gift-giving. After all, you’re supposed to give people something that they might find useful, for instance at work, and something that they don’t appear to own already. But really, that sort of commentary is pretty nasty and counterproductive. And I think this is a matter more for sincerity than nastiness. So here’s the text of the letter I’m sending along with the binding. The language is a little stiff and florid, but the feeling behind it is sincere. I am an American citizen, although I have been living in the United Kingdom for almost eleven years. Living abroad has given me an interesting perspective on our shared identity as Americans, particularly with regard to our Constitution. It really is a unique and valuable document, one that has made our country what it is today. I am concerned, therefore, by the ways in which your current policies do not reflect the values enshrined in this foundation of our nation’s law. I know that, as President, you must find a balance between the security of our fellow citizens and the culture of liberty that America values. I am sure you are sincere in the choices you have made. Unfortunately, I cannot agree with those choices, which seem to me to undermine many of our constitutionally guaranteed freedoms. I am particularly worried by the lack of trials for some citizens suspected of terrorism, the chilling effect that use of “free speech zones” has on the First Amendment rights of people who disagree with you, and the drive to use the Constitution to limit peoples’ freedoms and the states’ rights to legislate with regard to marriage. I am also concerned by our frequent disregard of the Geneva conventions, either by the reclassification of prisoners or by a simple failure to follow its rules. If we are to be the beacon of liberty to the world that we hope we are, then America must take the lead in defending peoples’ freedoms, both inside and outside of our borders. Peaceful, secure people do not as a rule join terrorist organizations; people who feel that their culture and religion are under attack may very well do so. By working in isolation and appearing to target Islam as a whole, we are the terrorists’ best recruiting incentive. 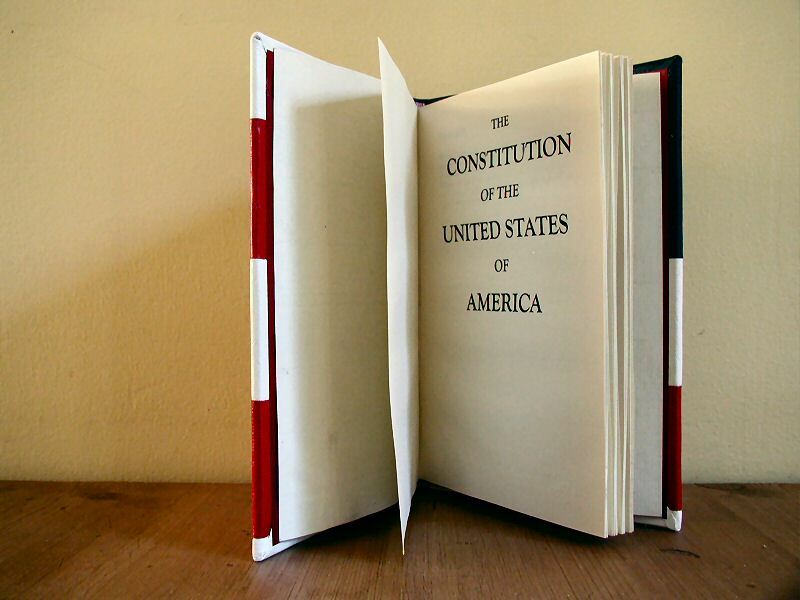 As a token of my regard for the Constitution and the ideals it expresses, I am sending you the enclosed leatherbound copy of this most important document. I created it myself, using traditional fine binding techniques. If you prefer not to keep it, I would appreciate its donation to an educational institution, where it can inform and educate another generation of Americans. Sing to me, Goddess, of the rage of Achilles, Pelias’ son. Menin. Rage. Homer opens the Iliad as I’d like to open this blog entry, but smooth English grammar doesn’t permit it. But rage, anger, wrath, fury, is what I want to talk about here. I’m American, but I’ve lived in the UK for over a decade. I’ve seen a way of conducting political (or religious, or philisophical) debate that most Americans don’t see, and that makes me worry about my native country. My mother went to Speaker’s Corner in Hyde Park on her most recent visit over here. The speakers and their audience were all discussing religion, both Islam and Christianity. All of the debaters were passionate about their faiths, and varied widely in their views. But, my mother commented, “It was so good-natured. We could never have something like that in the States. Someone would get lynched.” And she’s right. I’ve seen it in politcal debates online (witness the furore over entries on The Daily Kos and the thing with Kathryn Cramer, to name but two). I’ve seen it in the intensive partisanship that deadlocks Capitol Hill. I’ve seen it in media coverage, and media coverage of media coverage. I’ve seen it in real life, and I’ve felt it myself. There’s an undercurrent of eye-popping, vein-throbbing, fist-clenching and red-seeing anger in the way my fellow countrymen discuss important issues. In British politics, I’ve seen Tories and Old Labour politicians, whose positions are further apart than anything you’ll see in the American mainstream, debate with humor and wit. I’ve also seen them sling insults and sarcasm at one another without losing the plot. An entire British political institution, Prime Minister’s Question Time, where the PM has to answer questions put by the opposition, in public, every week, with extra added heckling from the back benches, would not be possible in the US. Everyone would take it all too seriously and someone would burst a blood vessel. This transatlantic difference leads to transatlantic misunderstandings. There is a perception in the US that the international media are “biased” against America. No doubt some media outlets are. But, at least in the UK, the media are “biased” against, in other words, critical of, pretty much everyone. Some of it’s a feeling that it is the duty of the Fourth Estate to question the powers that be. Some of it’s that conflict and scandal sell papers. Some of it is that the people who work in the media like that sort of conflict – that’s why they work in the media. Whatever the reason, the mainstream news sources over here use a harsher grade of investigative and invective sandpaper than their equivalents in the States. But because these things aren’t automatically personal, and aren’t taken as such, the system works. Now, there is a valid argument that serious matters require serious discussion. Wars, death, money, politics – these are no laughing matter. Europeans, with a cynical smile for every issue, are preceived as being careless, ineffective, and effete. It’s like that little smile that Alex gets when he’s being really defiant and difficult. Taking things lightly like that is bad. We must be serious. That’s all very well until seriousness leads to over-seriousness and a personal identification with the cause under discussion. Then an attack on a position is an attack on the person holding the position, and we’re back to rage and thoughts of power tools. What we’re not doing, when we get angry, is listening to the other side. And without listening, there can be no discussion, no cooperation, no compromise, no peace. So please, can we laugh a bit, and let go of the wrath? Where’s the Black Squad when we need them? Q: What do weapons of mass destruction have to do with cot death? A: In both areas, the “experts” evaluating the evidence and acting on their conclusions have caused enormous devastation. Then, after the fact, that evaluation has proven wrong. Why? I have an insight that may be useful. I’ve held a number of jobs in my working life. The three that I’ve spent the longest at, though, are paralegal (2 years), financial auditor (3 years) and software tester (7 years and counting). Though they seem quite varied, they have one common factor: they’re all about the evaluation of evidence. Lawyers and paralegals, of course, work with evidence all the time: gathering it, presenting it, writing about it. There’s no pretense of neutrality. A trial lawyer’s job (aided by paralegals) is to find evidence that supports one particular view, and to discount evidence that doesn’t. Financial auditors are, on the surface of it, very different from lawyers. They go into companies at the year end and check the financial accounts those companies produce. Each stage of the audit is made up of tests on certain aspects of the accounts, whether it be a stock count to ensure that the inventory numbers are correct, or a check of reconciliation procedures to allow the auditors to rely on internal financial systems. And for each stage of the audit, we used to state the specific object of the test. I still remember the format. To accumulate audit evidence that stock valuations are materially accurate and correctly stated in the year end accounts. The public used to percieve auditors as unbiased and neutral (possibly even stringent and difficult to satisfy), but of course the scandals of recent years (the Maxwell empire, Baring’s, Enron) changed all that. Everyone knows the subtle, unstated pressure that the auditors are under when they go into a company, particularly one which pays the firm’s consultancy arm large fees. It’s almost unheard of for a Big Five firm to refuse to sign off a set of accounts. Learning about software testing allowed me to see consciously what I knew unconsciously already. The audit process is biased in favour of approval, and any such bias makes an enormous difference to the results obtained. This is a phenomenon that testers are painfully aware of – it’s the reason that software has to be independently tested. Reread the sample “object of test” above in the light of that quote. What is the goal of the test? Is it to find “bugs” in the accounts, or to establish that they aren’t there? How likely does that make it that we would find errors? The most successful software testing teams are the ones who take a skeptical, or even hostile, attitude toward code quality. IBM’s infamous “Black Team” took this to extremes, dressing in sinister clothes, cheering when they found bugs, and deliberately striking fear into the hearts of the programmers whose code they tested. The reliability of mainframe operating code is their legacy – we wouldn’t have a hope of achieving “six nines” (99.9999%) availaibility had they not found the bugs they did. So if bias affects results, how then do we view Professor Meadows and his eponymous Law (“One cot death is a tragedy, two is a coincidence, and three is murder unless proven otherwise.”)? His testimony has jailed women since acquitted of the deaths of their children, and caused authorities to remove babies from their parents, sometimes permanently. Yet statisticians claim that he took a “stamp collecting” attitude toward evidence, including the cases that supported his views and overlooking the others. And given the above axiom, how did he approach the deaths of children, when asked to testify at their mothers’ trials? How a similar bias could affect the officials of two governments, when considering whether to send in the tanks, is left as an exercise for the student. But it begs the question: will any enquiry that focuses on the evidence, rather than the objectives of the people evaluating that evidence, really explain the conclusions that led to war? This is listed at $150.00 on Amazon at the moment. That’s pretty expensive, even for a computer book, but this one’s worth it. It’s 177 pages long and has been indispensible since its publication in 1979…quite a contrast to Martin’s Microsoft exam books, which can run to over a thousand pages and are obsolete before the ink dries. So the finger-pointing about weapons of mass destruction rages on. Did Iraq have any? If so, where are they? If not, why did Saddam Hussein not co-operate with the inspectors? Did the British and American governments mislead their voters about the evidence? Did the intelligence services mislead the governments? We await further information with bated breath. In the meantime, though, the pro-war lobby has fallen back on Plan B to justify the whole exercise: Saddam Hussein was a Bad Man. He did Bad Things to the people of Iraq. So we were justified in removing him. For short, I’ll call this the Bad Man doctrine. The Bad Man doctrine is very appealing. It purports to make the world a better place by removing tyrannical regimes and replacing them with kinder, gentler ones. It is illegal, of course, under international law, but so are so many things that go on in politics. But there are two very fundamental objections that I can see to the Bad Man doctrine. The first problem is that one country’s Bad Man is another country’s strong leader, doing the difficult thing in difficult times. Who’s the Bad Man in the Israel-Palestine conflict, for instance? We saw this a lot in the Cold War, when the definition of a Bad Man was mostly based on the political and economic ties between his opposition and the country doing the judging. This led to democratically elected but communist leaders like Allende being deposed for capitalist tyrants like Pinochet. Nor were the Soviet policies any more defensible: think Prague Spring, for instance. The second difficulty is that, even if we can agree a definition of a Bad Man that is more based in the interests of his victims than his politics or personal fortune, what do we do about it? There is no country in the world with the desire or the resources to sort out every murderous regime in the world. The Coalition of the Willing, for disparate reasons, supported the invasion of Iraq. How big a Coalition are we going to get to displace Mugabi from Zimbabwe, or the military junta in Burma? Unless the Bad Man doctrine is enforced consistently, it’s like the loitering and vagrancy laws in some American states – an excuse for pursuing private agendas, or for arresting people on insufficient evidence. We’d have to invent a Really Bad Man doctrine, and then we’d be back at problem one again. I’d rather we faced the situation and told the truth. If there were no weapons of mass destruction, then the coalition has egg on its face. If there were, then we can debate the legalities of the war as it was presented to us. And if the politicians lied to the people, or the spooks lied to the politicians, then it’s time for some heads to roll. In the days immediately after September 11, 2001, the US appealed to the world to side with it against terrorism, both on the basis that combating terrorism is the right thing to do, and because America had just suffered such a terrible attack. The world responded, at least for a time. Now, let’s be clear. Combating terrorism is the right thing to do, though very little of it can be done effectively with guns and bombs. Most of it requires diplomacy, tact, mediation, and a passion for justice. But I digress. I want to talk about the second reason the world responded to the US’s appeal: suffering. Many people all around the world had mixed feelings about the attacks on the World Trade Center. On the one hand, they were horrified and grieved. On the other, deep down, they were hopeful. I saw an interview with a Palestinian the other day, talking about those first weeks. “We thought Americans finally understood what we have been suffering,” he said. “We thought that at last they would help us.” An Israeli would have said the same thing, no doubt. There was a time, fortunately a brief one, when the American government seemed to use its people’s suffering as a justification for any action it chose to take. (Using the justification that the US has the military, political and economic might to enforce its will on the rest of the world, which is the current policy, is just as mistaken and much more dangerous. It is no wonder that most other countries are no longer “on side” with the US. But that too is a digression.) The fact that America has suffered is important, but not for that reason. Flashback to the days before September 2001. For decades, the United States had been fortunate enough to escape the fate of so many countries all over the world. American civilians (and military personnel, for the most part) were safe. As in any society, they feared crime, but they did not fear atrocity, unlike the people of Spain, India, Pakistan, the former Yugoslavia, Algeria, Indonesia, Sri Lanka, Israel, the Palestinian Occupied Territory, etc, etc. And in their safety, Americans became increasingly inward-looking, more and more self-centered, less and less concerned about the impact of their actions on the rest of the world. Extremism feeds on that kind of insularity, and uses the simplistic worldview it fosters to generate sympathy and funds. Over the decades, individual Americans and the American government had supported various terrorist and pseudo-terrorist causes. The IRA, when it was bombing Britain’s cities, killing its innocent civilians, and attempting to assassinate its leaders, received substantial funding from Americans via NORAID. The CIA’s support of organisations and institutions now considered terrorist is also well documented. I cannot believe my people would have supported, or permitted, such things if the devastation they caused had been as real to them as the attack on the Twin Towers came to be. Flash forward again to the present. The anniversary last week allowed people to get back in touch with their grief – and their anger. Now, anger is like fire: it’s a good tool, but a poor master. In the aftermath of any terrible event, it is anger that gets us back on our feet. But it also clouds our judgement, and makes us heedless of the consequences of our actions. In their fury, my fellow countrymen have been tempted to use their grief as a lever, or an excuse. “We’ve suffered,” was the argument, “so we’re entitled to do whatever we have to to feel safe again.” Phrases like “acceptable losses” and “collateral damage” came up, people nodded wisely and looked stern. But two wrongs don’t make a right, and making other people suffer will not make us feel better in the end. Pursuing a course of justice, where suspects are tried and the guilty are punished is part of the answer, but only part. To really heal, we need our grief as well as our anger. Grief drives us to make something good come out of devastation. It unites us across ethnic, cultural, and national boundaries, and renews our empathy. Knowing what it is to suffer ourselves, we can imagine how other sufferers feel, and be touched by the desire to help them. And in helping others, we heal ourselves. More than that: we grow. We become stronger than we were before. We are more than whole, and live in a better world than we did before. This is the great gift of any suffering, the silver lining in the blackest cloud. This is the challenge facing the United States, and indeed all of the West: to wake up to the shared suffering of the world, and build out of it a better place for our children. That would be a fitting memorial to honor those affected by September 11. I am an American, and proud of that fact. My nation was founded on a set of philisophical principles which I share. They were revolutionary at the time. Actually, they’re pretty controversial now, if you take them seriously. I believe that all men – and women – are created equal. Note that I didn’t say all Americans there. People in the Third World, who don’t speak English and aren’t as wealthy as I am, are my equals. Their suffering matters, and their lives matter. I believe that we are endowed by our Creator with certain unalienable rights, including the rights to life, liberty and the pursuit of happiness. Again, that means all of us, including people who will use those rights in a way I don’t approve of, and people who will voluntarily relinquish said rights. I will address the issue of liberty, and the missing link to responsibility, another time. This does not mean that the United States has the right to, for instance, protect these rights for citizens of other countries. But it does mean that any American foreign policy that takes these rights away is a bad idea. I believe that sovereignity derives from the consent of the governed, and that governments are accountable as a consequence. This is the one I want to talk about right now, in the light of some reactions to my comments on September 11. This also means that my government is my employee, answerable to me. I have the right to question and even criticise it if I think it is doing the wrong thing. Actually, I have a responsibility to do so. Historically, of course, this right and responsibility have been more honored in the breach than in the observance. Governments don’t like criticism, and when the national mood is particularly fervent, neither do ordinary citizens. That does not dilute the responsibility. On a more pragmatic note, criticising bad government policy is the only way to get good government policy. No one’s ideas are universally correct; good ideas are developed by discussion and concensus, and bad ones killed by the same process. Writers know this – submitting your work to criticism is the only way to hone and improve it. Government is no different, and it is the duty of responsible citizens to participate in public debate to help improve policy. The most pernicious trend in US public life today is the stifling of this debate, the denial of this responsibilty, and the relentless kowtowing to the government. But surely, comes the answer, in the national interest, we have to do things that are incompatible with our Constitution? They are unpleasant, but they are necessary. I believe we cannot write straight with crooked lines. The ends do not justify the means. Not even desperate times. This is when we need to cling to our principles more tightly than ever. The world is not a safer place, as our politicians promised at the time. It’s, if anything, a worse place for most people. Before I go on, let me say something to those who will be offended and stop reading halfway. Just because someone is critical of, say, your nation, does not mean they’re wrong, or biased. It could mean your nation is on the wrong track. Getting in a huff won’t solve the problem. Palestine, the goad that drives the Islamic world to terrorism, is in a worse state than ever. Israel, driven by the same fears that drive the US, has not taken the terrifying, courageous and necessary leap toward co-operation, and after some brief gestures in that direction, their strongest backers have not pressured them to do so. America, by the way, should take a good look at how dreadful everyday life is for Israeli civilians. This is where the US’s current foreign policy is taking our nation. The impetus toward war in Iraq continues. Americans seem to want it, and George Bush wants it (to finish what Daddy started, maybe?). Tony Blair, perhaps trying to be more “presidential”, is trying to persuade a skeptical British public that such a war is a good idea. I don’t think he’ll succeed. Will he commit the UK anyway? Climate change continues, unabated, because the worst polluter has yet another reason not to care. Yesterday it was floods in France and the drought in Africa continues unreported while the richest nation in the world drives its SUVs with the flag at half-mast. And (lower on the list, since it kills no-one directly) my native land, blinded by fury, has lost hold of its guiding principles. Where is the liberty and justice for all? I await the trials of the people in Camp X-Ray, currently in a most unpleasant legal limbo. I await the restoration of genuine freedom of speech, where the right to say what you like even if it is unpopular is protected. I await the return of the mindset that made America a true beacon of liberty to the world, before she became obsessed, before she discovered that she could do so many things and forgot to ask if she should. I am filled with sadness for the thousands who died a year ago. But I am also filled with sadness for the thousands who died offscreen, getting up not in comfortable, secure homes but in refugee camps and sun-scorched farms. These people mattered too, and were beloved of their families too. They were innocent, and they were heartbreakingly brave in the face of terrible adversity, but where are their parades and their memorials? Sheesh. It’s been over a month since I’ve written anything. A busy month. We’ve been to the Marott AGM in the north of England, just of Hadrian’s wall, and we’ve been back to California for a fortnight. Then we had the delights of dealing with an 8-month old with jet lag (a highly recommended experience for all masochists). Now we’re going on the separation anxiety rollercoaster, introducing Alex to the nursery where he’ll be spending 2 days a week. The trip to the US was the strangest, and the most stressful, of all these things. Living abroad has really changed my perspective on my native country and its role in the world. I am becoming an expatriate not simply by location but by conviction as well. This is not a result of September 11, although those events highlighted, and are a result of, the things that make me feel so much less at home in the States. America is a nation founded by idealists, on ideals such as individual liberty, justice, and freedom. Sadly, though, the dominant culture seems to think that simply believing in these things is enough; they are not a basis for action. Certainly, they are not principles informing American foreign policy, and have not been for some time. To most of the world, America is the emblem of selfishness, might makes right politics, and economic exploitation. I have brought these topics up to Americans, and seen others bring them up. The usual response is to deny that America should be answerable to the rest of the world…Son of Star Wars and the abandonment of Kyoto, for instance, are just the US looking out for its own interests. The basis of that argument is that the US is too powerful, and too self-sufficient, to have to take the consequences of its actions, which would be irresponsible even if it were true. What worries me most is that most Americans don’t really want to know why anyone would think the US was not the best country on the planet. They don’t want to hear that America is feared and hated, or that it is looked upon as arrogant and self-centered. Why would anyone hate us?, they ask, wanting only insanity as the answer. They never ask why the terrorists chose the World Trade Center, not the Statue of Liberty. They still see America as a beacon of hope and liberty to the world. And America could be a beacon of hope and liberty. But it would require hard work and sacrifice for the principles that the nation was founded on. It would mean valuing the thousands who will starve in Afghanistan because food aid didn’t get in while the bombing went on as highly as the thousands who died in the World Trade Center. It would mean that we couldn’t all have a car, because our grandchildren will want a climate they can live in. It would mean the US Army couldn’t block landmine treaties because they want to use landmines, and that US chemical weapons facilities would be as open to inspection as Iraq’s. It would mean enforcing justice in areas where it has historically taken sides (the Middle East), and acknowledging its own past of supporting terror (the refusal of San Francisco courts to extradite convicted IRA terrorists comes to mind). Of course, in the land of free speech, saying things like this will get you lynched, conversationally at least. That’s the worst of it…the US is straying from its principles in order to defend them. Fair trials? How will any member of Al Quaeda fare? Any other trial where elected officials had publicly proclaimed a defendant’s guilt and the press had systematically biassed all potential jurors would get a change of venue. Bin Laden won’t even get to hear the evidence against him, since its revelation would compromise classified material and agents. But if the US would wake up and listen to its allies, act in accordance with its principles, and become the good global neighbor it thinks it already is, what could it not achieve? America could build a world where no one was so robbed of opportunity that he wants to blow himself up for a cause, where terrorists have no network of supporters and are reduced to carrying sandwich boards to spread their views, where peace was the norm. That would be a place worth living with, and in. I’m not holding my breath. Maybe, in time, the US will sink back into apathy. Until then, I don’t think I’ll move back. It’s a nice place to visit, but I wouldn’t want to live there.